A Lame Duck Squawks, But Why? 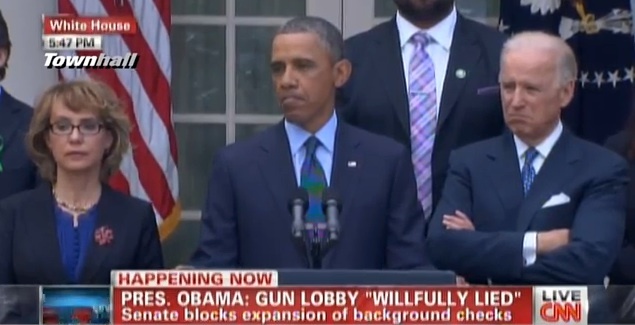 After his gun control proposals were defeated today in the Senate, President Obama gave a speech in the Rose Garden, surrounded by Joe Biden, Gabrielle Giffords, and Newtown parents. He went on what can charitably be described as an angry rant. If only he had shown this much emotion about, say, Benghazi! But why was Obama so angry? I wrote here that it was odd for Obama to make gun control the signature issue of his second term, since there has never been any chance of significant gun control legislation being enacted. It couldn’t possibly get through the House. So why, today, was he so irate about its failure in the Senate? As we have noted more than once, pretty much everything Obama does is intended to stir up the Democratic Party’s base to drive turnout in 2014. Obama knows he can’t do much of anything as long as the GOP holds the House, so his primary goal is to stoke outrage on the left, in hopes that 2014 will look like 2008 and 2012, and not like 2010. So no doubt he hoped that some gun control measure–any gun control measure!–could get through the Senate, so that pressure, probably irresistible, could be brought to force a vote on the same proposal in the House. Not so that it might pass, but so that House Republicans would be on record voting against gun control. Obama could have raised countless millions from his fervently anti-gun base to go after the more vulnerable such Republicans. Now, the issue won’t even come up in the House, and Obama and the Democrats will have to find something else. That, I think, is the best explanation for the profound disappointment that Obama showed today.